Swallow applauds House Republicans for stopping short of launching impeachment proceedings. Scott Sommerdorf | The Salt Lake Tribune Rep. Brad Dee, R-Ogden, pauses before entering the Republican caucus room, Wednesday, June 19, 2013. 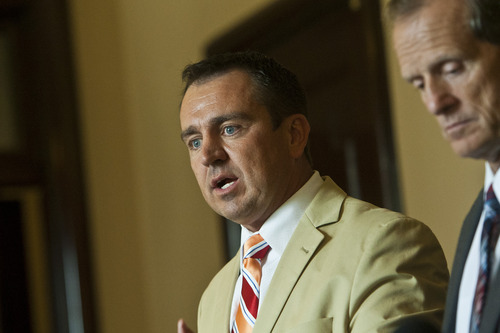 Utahns were gathered in the Capitol Rotunda in a show of solidarity to protest alleged corruption in the attorney general's office as House Republicans meet to discuss possible impeachment proceedings against John Swallow. Chris Detrick | The Salt Lake Tribune Attorney General John Swallow talks to members of the media outside of his office at the Utah State Capitol Wednesday June 19, 2013. Chris Detrick | The Salt Lake Tribune Majority Assistant Whip Don Ipson, R-St. George, talks to members of the media about Attorney General John Swallow Wednesday June 19, 2013. 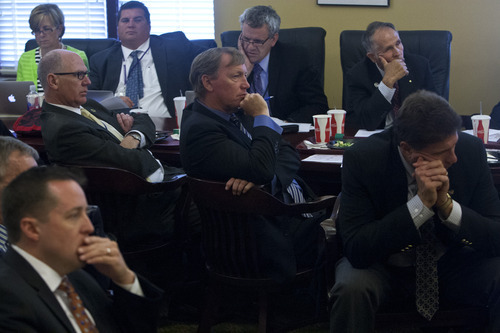 Chris Detrick | The Salt Lake Tribune House Republicans listen as Legislative General Counsel John Fellows talks about the possibility of impeaching Attorney General John Swallow in the Utah House Republican caucus room Wednesday June 19, 2013. 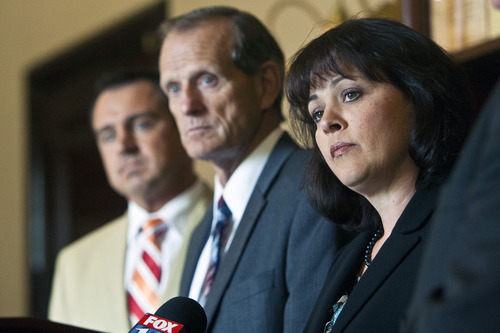 Chris Detrick | The Salt Lake Tribune House Speaker Becky Lockhart, R-Provo, House Majority Leader Brad Dee, R-Ogden, and Republican Whip Greg Hughes, R-Draper, talk to members of the media about Attorney General John Swallow Wednesday June 19, 2013. 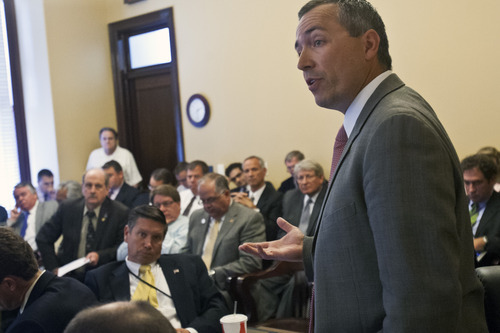 Chris Detrick | The Salt Lake Tribune Rep. Johnny Anderson, R-Taylorsville, talks about the possibility of impeaching Attorney General John Swallow in the Utah House Republican caucus room Wednesday June 19, 2013. 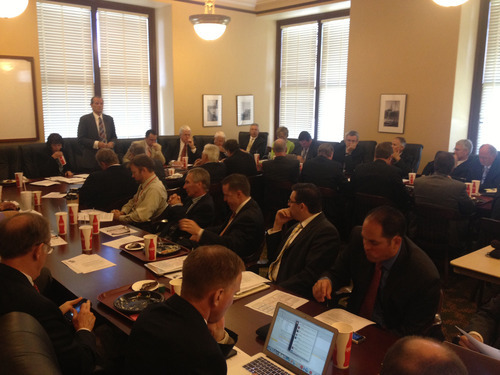 Chris Detrick | The Salt Lake Tribune House Republicans meet June 19, 2013, to discuss possible impeachment proceedings against Utah Attorney General John Swallow. Scott Sommerdorf | The Salt Lake Tribune Naomi Franklin of the League of Women Voters holds up a sign describing her views at a rally in the Capitol Rotunda showing solidarity to protest alleged corruption in the attorney general's office as House Republicans meet to discuss possible impeachment proceedings against John Swallow, Wednesday, June 19, 2013. 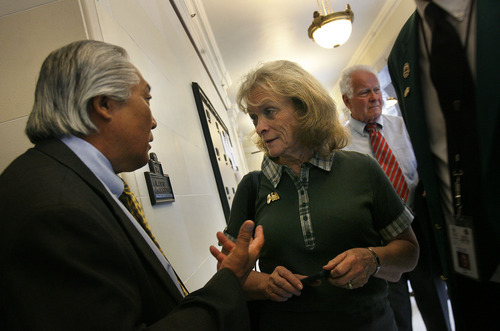 Scott Sommerdorf | The Salt Lake Tribune Rep. Curt Oda, R-Clearfield, speaks with Eagle Forum founder Gayle Ruzicka at the entrance to the hallway leading to the Republican caucus room at the Capitol building, Wednesday, June 19, 2013. Utahns gathered at the Capitol Rotunda in a show of solidarity to protest alleged corruption in the attorney general's office as House Republicans meet to discuss possible impeachment proceedings against John Swallow. 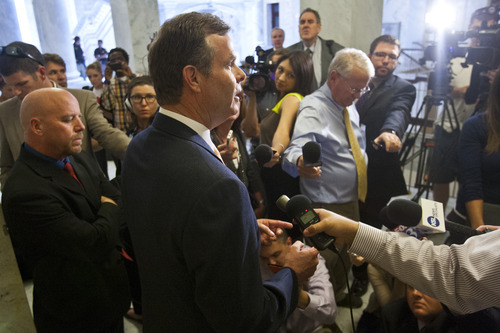 Chris Detrick | The Salt Lake Tribune Attorney General John Swallow talks to members of the media outside of his office at the Utah State Capitol Wednesday June 19, 2013. Chris Detrick | The Salt Lake Tribune Legislative General Counsel John Fellows talks about the possibility of impeaching Attorney General John Swallow in the Utah House Republican caucus room Wednesday June 19, 2013. 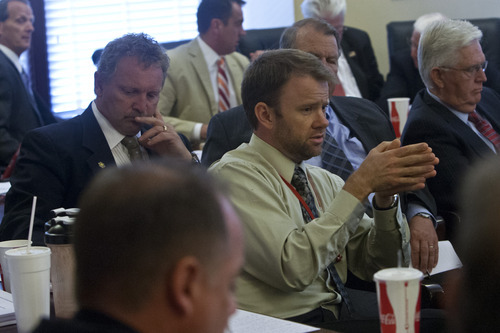 Chris Detrick | The Salt Lake Tribune Rep. Jacob Anderegg, R-Lehi, talks about the possibility of impeaching Attorney General John Swallow in the Utah House Republican caucus room Wednesday June 19, 2013. Chris Detrick | The Salt Lake Tribune Republican Whip Greg Hughes, R-Draper, talks to members of the media about Attorney General John Swallow Wednesday June 19, 2013. 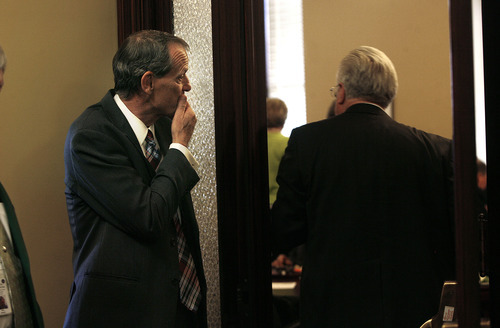 Chris Detrick | The Salt Lake Tribune Rep. Dan McCay, R-Riverton, talks about the possibility of impeaching Attorney General John Swallow in the Utah House Republican caucus room Wednesday June 19, 2013. 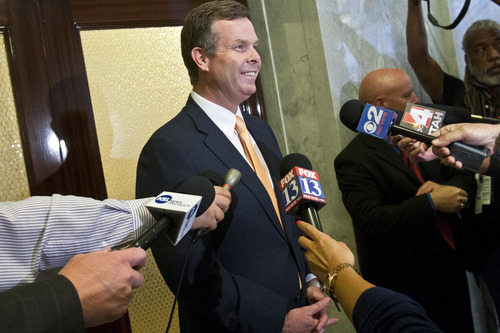 Chris Detrick | The Salt Lake Tribune Attorney General John Swallow talks to members of the media outside of his office at the Utah State Capitol Wednesday June 19, 2013. 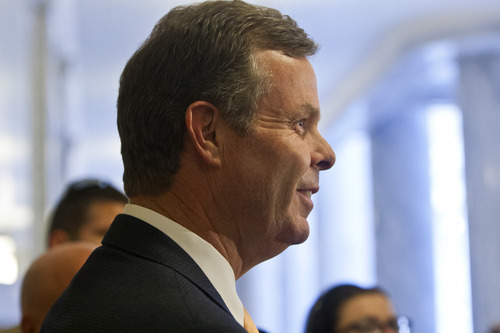 Utah House Republicans voted Wednesday to investigate Attorney General John Swallow, stopping short of launching impeachment proceedings against the state&apos;s top cop, but leaving that option open. House Speaker Becky Lockhart, R-Provo, will assemble the chamber for extraordinary session July 3  the first time in history a speaker has taken such a unilateral action  to set rules, define the scope, and appoint members of a special investigative committee. "It was a very overwhelming vote in terms of moving forward with the investigation. We all, as a body, have been frustrated with the lack of information," Lockhart said after the GOP caucus vote. "We want our own information. We want to be able to own that information as representatives of the people." The bipartisan panel will be given the power to subpoena witnesses, put them under oath, gather documents and report back to the House with its findings. It will likely also have a budget to hire attorneys or investigators. The panel could not begin the impeachment process on its own accord, but the House could bring articles of impeachment based on the committee&apos;s findings. Because the committee would not be tied to impeachment, it could investigate others besides Swallow and delve into actions before he took office. A spokeswoman for Gov. Gary Herbert  who said last week that he would fire Swallow if he could  reported that "the governor supports the process and the Legislature&apos;s prerogative in pursuing it." Swallow, who for six months since taking his oath has fought off allegations of impropriety, listened from his office to the House Republicans debating the impeachment issue. He praised their decision and promised to cooperate with the investigative committee. "They got it right today where they decided it wasn&apos;t time yet to start any serious discussion about impeachment. They simply need answers, and I&apos;m willing to provide those answers," he said. "I see this as a first, important step to restoring public trust." 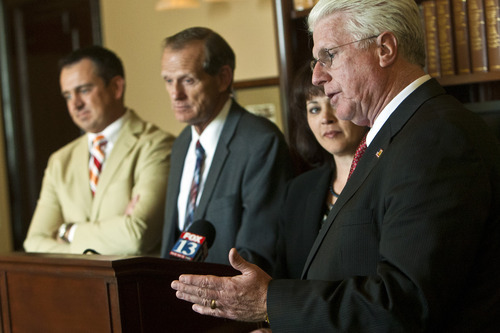 The Republican attorney general said he would "absolutely not" resign  even though a poll by Brigham Young University showed nearly 80 percent of Utahns want him to step down and 71.5 percent would support impeachment proceedings. Swallow faces investigations from federal, state and county authorities into numerous allegations, including that he helped broker deals to assist a businessman suspected of cheating customers and that he promised protection to potential donors of his predecessor, Mark Shurtleff. Swallow spoke to conservative House members Wednesday before the caucus to answer questions and urge them not to rush into action. He told them he expects the FBI to complete its investigation in 60 to 90 days. "I know what I&apos;ve done and what I haven&apos;t done. I know the allegations are coming from very incredible sources, yet it&apos;s on the front page every day. It sounds an awful lot like a witch hunt to me," Swallow said. "And when the truth comes out, people will know and understand that the person they elected as attorney general is the right person for the job." 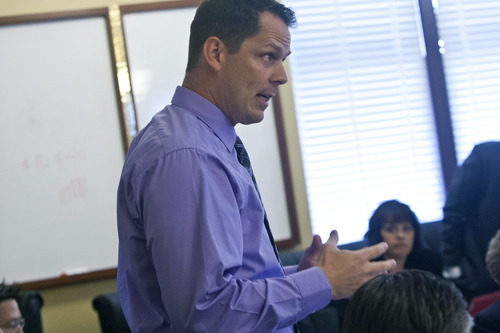 House Majority Leader Brad Dee, R-Ogden, argued that legislators cannot rely solely on media reports about the allegations against Swallow, adding that it&apos;s unclear when the various investigations would wrap up. "I was praying last night they&apos;d come forward with something this morning," Dee said. "I&apos;ve come to the feeling that I want my own information. That&apos;s where I&apos;m at. I don&apos;t want to have to depend on somebody else&apos;s. … I&apos;ve come to the belief that doing nothing is probably the worst thing we could do." 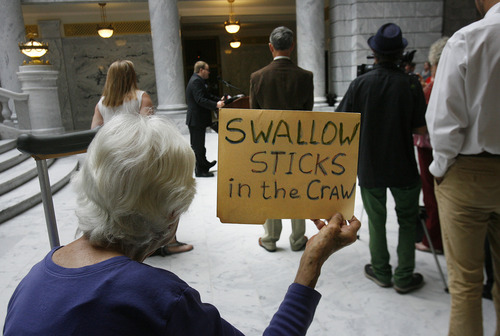 If the House investigation does result in impeachment, Swallow could become Utah&apos;s first state official to suffer that fate. In 1935, the House explored impeachment but abandoned the process and, in 2003, articles of impeachment were prepared for a judge charged with drug crimes, but he resigned. Rep. Ken Ivory, R-West Jordan, fought against the creation of the investigative committee, arguing there were too many unanswered questions about the panel&apos;s scope, cost and legal authority. He urged legislators to wait a few months before moving ahead. "[I&apos;m] not comfortable," Ivory explained, "saying that federal investigators who are professional investigators, county attorneys who are professional investigators, are not worthy of our trust." Meanwhile, Rep. Spencer Cox, R-Fairview, said the House GOP&apos;s action didn&apos;t go far enough, giving it a tongue-in-cheek label, "the pretend impeachment committee." Noting tapes that show apparent wrongdoing by Swallow, he said lawmakers were "shirking" their constitutional responsibility to restore the public trust in the officeby not beginning impeachment proceedings that could clear the attorney general or lead to his ouster. "I&apos;m embarrassed by members of our own body who rail against the federal government and then plead for us to wait for the now suddenly brilliant Federal Bureau of Investigation to do our constitutional responsibility. I&apos;ll be damned if I&apos;m going to let them restore the public trust." The cost of the House investigation is unclear. 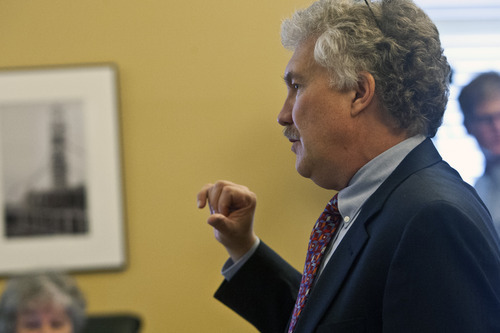 Legislative attorney John Fellows said an impeachment in Connecticut a decade ago cost as much as $6 million, but that was an extreme case. Rep. David Lifferth, R-Eagle Mountain, demanded to know the investigation&apos;s price tag before proceeding, but Lockhart countered that it would cost what it cost. "Can we put a price on the public trust?" she asked. Democrats, who had unanimously called for an investigation of the allegations against Swallow, supported the majority GOP&apos;s decision to form a special investigative committee. They talked briefly about impeachment during their own caucus Wednesday before tuning in to the Republican meeting streamed over a laptop and beamed onto the committee room wall. House Minority Leader Jennifer Seelig, D-Salt Lake City, said the vote to create an investigative committee "is consistent with the position that we articulated a few weeks ago and then reaffirmed today both in caucus and [in] our letter [to the House speaker]." "The committee has got to be bipartisan," Seelig said, "to ensure the integrity of the oversight and to send a clear message to the public that this is authentic." She also stressed that the probe must be transparent and open to boost public confidence in the outcome. Rep. Brian King, D-Salt Lake City, said he was disappointed that the Republicans made their decision on how to proceed on the Swallow matter in a meeting that excluded input from Democrats  although King observed the meeting. He said it should have been a decision made by both parties. Lockhart said the makeup of the investigative committee remains to be seen. On most panels, majority Republicans outnumber Democrats. But the House Ethics Committee, for example, is made up of equal numbers from both parties. Derek P. Jensen contributed to this story.